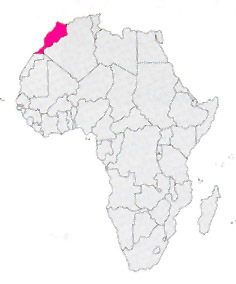 This kingdom of the Northern Africa, leaned out on the Mediterranean and on the Atlantic, that raises it with the mountains of the Atlas and trespasses toward the dunes of the Sahara, it is one of the most beautiful countries of the African continent and perhaps of the world. The landscape is fantastic and very various, with beautiful coasts and tall mountains (the atlas culminates to 4.165 meters msl) and with the arid Saharan part, but ploughed and engraved by many uadis and interrupted by wide oases. But it is the beauty of the imperial (Rabat, Meknes, Fes and above all Marrakech) cities, the colors and the smiles of the people, the animation of the bazaars, the lost charm of the sub-Saharan casbahs, they make unique this nation. The Djemaa plaza el-Fna to Marrakech; the medina of Fes with the tangle of the alleys where they lean out unthinkable jewels; the throats dug in the rock by the River Todrha; the casbahs of the valley of the Dades; the villages of the atlas as Tafraout, Tifoultout, Ait Benhaddou and the casbah of Taourirt to Ouarzazate are unforgettable.